Magnetic fields, like electric fields, are completely superposable. So, if a field is generated by a current flowing through some circuit, and a field is generated by a current flowing through another circuit, then when the currents and flow through both circuits simultaneously the generated magnetic field is . This is true at all points in space. Figure 22: Two parallel current carrying wires. This follows from Eq. (152), which is valid for continuous wires as well as short test wires. The force acting on the second wire is directed radially inwards towards the first wire. 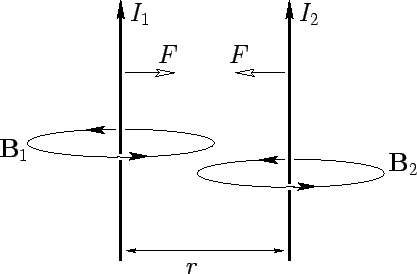 The magnetic field-strength at the first wire due to the current flowing in the second wire is . This field is orientated at right-angles to the first wire, so the force per unit length acting on the first wire is equal and opposite to that acting on the second wire, according to Eq. (152). Equation (156) is called Ampère's law. One ampere is the magnitude of the current which, when flowing in each of two long parallel wires one meter apart, results in a force between the wires of exactly N per meter of length. We can see that it is no accident that the constant has the numerical value of exactly . The SI system of units is based on four standard units: the meter, the kilogram, the second, and the ampere. Hence, the SI system is sometime referred to as the MKSA system. All other units can be derived from these four standard units. For instance, a coulomb is equivalent to an ampere-second. You may be wondering why the ampere is the standard electrical unit, rather than the coulomb, since the latter unit is clearly more fundamental than the former. The answer is simple. It is very difficult to measure charge accurately, whereas it is easy to accurately measure electric current. Clearly, it makes sense to define a standard unit in terms of something which is easily measurable, rather than something which is difficult to measure.